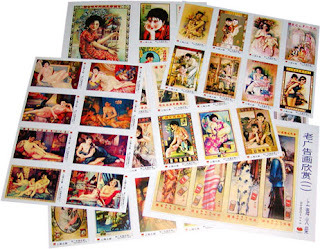 On the matchbox labels are old Chinese advertisements for Cigarettes in early 20th century. The early twentieth century was a period with tremendous economic, political and social changes for China. Two of the changes were the popularity of gender equality and the increased trade with the West. On the labels are pretty Chinese girls, some are even half-naked in various poses. The influence of the west on these designs is obvious: the women's short cropped hairstyles and brassy makeup were an obvious nod to the Hollywood styles of the time, and their heavily rouged cheeks and cherry red lips evoke images of the lusty, exciting Shanghai of that era. Some elements of the poster art, though, were adjusted to cater to the local audience. The ladies were very often portrayed wearing a traditional Chinese silken gown, or qipao, with a high collar.They were also shown in vivacious scenes, sometimes with a child or engaging in an outdoor activity that suggested a sense of the emerging modern middle class in China from that period. Usually, though, the women in the pictures were unrelated to the products they were selling. Poster by Shi Qing for the Wuhu Jing Lun Silk Company Inc. This poster was most likely published in Shanghai. Cigarette companies during the 1920s-1930s often used Chinese women dressed in Western attire to promote their products to the local market.